“No Longer at Ease” begins with a seemingly endless frenzy of blessing. Obi Okonkwo is being sent from his home in Nigeria to England to become educated. His relatives and friends, who are paying his way, praise him, embrace him and pour protective chants over every inch of his being. Obi stands rigidly in his smokestack-gray European suit, a swirl of dancing, clapping Afrikaans encircling him, all dressed in the colors of sunrise. Some new creature is being born amid this glorious cacophony: not quite African any longer, not quite European, ever. Nigeria is at the dawn of independence from Britain, and Obi is the image of that new day. But, bit by bit over the next two hours onstage, Obi’s life splinters, then cracks, then shatters. e.g. 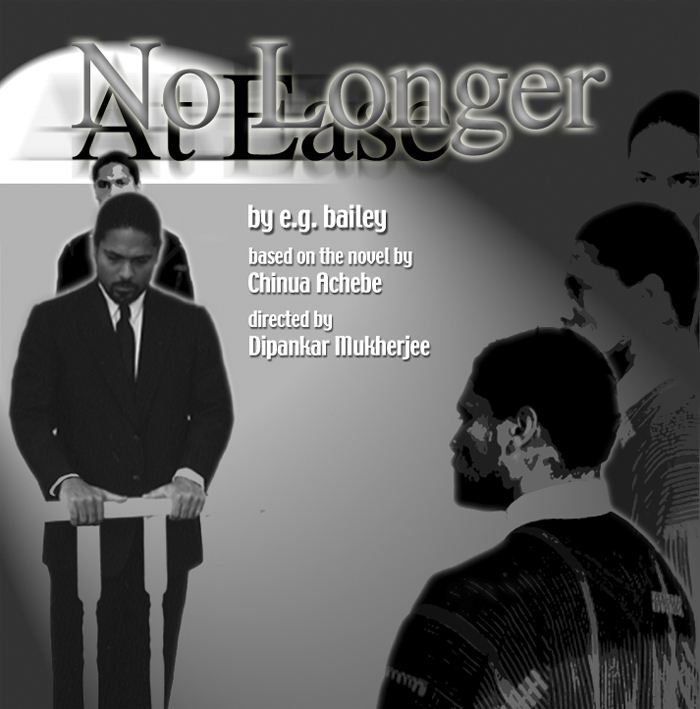 bailey’s adaptation of Nigerian author Chinua Achebe’s novel is a big-hearted, thrilling theatrical experience. Pangea World Theater’s production, directed by Dipankar Mukherjee, is sonically and visually overcrowded, and the acting is often underpolished. 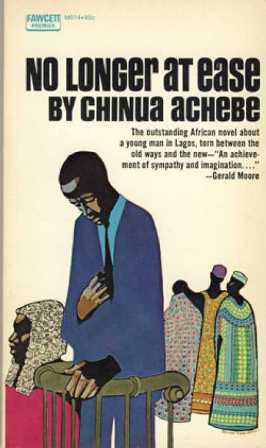 But the sheer force of bailey’s — and Achebe’s — storytelling, the emotional commitment of the actors and the power of luminous ideas leaping up from the text like solar flares coalesce into an extraordinary evening of theater. Obi’s story may be specifically Nigerian in context, but it is universal in content. As he becomes educated and moves out into the world, he takes up residence in the rift between modern Western culture and ancient tribal values. Is he becoming absorbed into — or possessed by — the European mind? Or is he rightfully shedding outdated tribal customs? He falls in love with an educated woman who, it turns out, carries a generations-old ancestral curse. Marrying her would bring shame not only to his living family, but also to generations of his children not yet born. For him, this is nonsense; but for his family, it is unquestionable truth. The beauty of Pangea’s production is in its evenhanded depiction of these burning dilemmas. A story that could become an easy harangue about white people, Europe, Christianity and colonialism becomes instead an intricate, magnetic dance of energies — social, political, religious, ethical and personal. In the role of Obi, James Young II moves through the play like a single powerful muscle flexing and contracting again and again. As Clara, Obi’s cursed fiancee, marie-francoise theodore fills her character with a modern sexiness and ancient torment. Ronnell Wheeler’s ebullient African dance at the top of act two is a joyful highlight. Mukherjee likes to direct the living daylights out of a show. Drums pound from above; actors hum and click their teeth and wave their arms in vaguely ritualistic motions; lights undulate across long banners hung from the ceiling, each painted with Seitu Jones’ symbolic visions. Sometimes it’s all gorgeous, but too often, you feel you need to hack your way through the jungle of theatrics to make your way to the play. Still, it’s stimulating theater. Jaime Meyer is a local free-lance reviewer. Originally printed in Saint Paul Pioneer Press.